As we documented in a post one year ago, what The Economist once called the “unstoppable” internationalization of China’s currency—the RMB—has been stopped. Indeed, reversed. 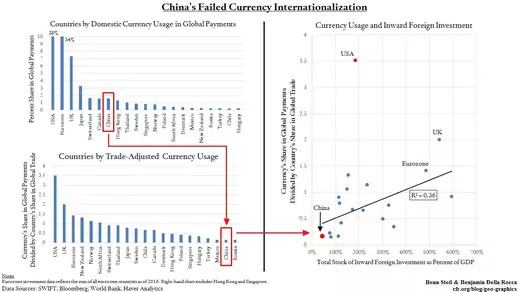 As the left-hand graphic above shows, even though the RMB is the 7th most widely used in global payments (top figure), settling 1.6 percent of transactions, it is only the 20th most “globalized” among major currencies—as measured by adjusting for how much trade each country does (bottom figure). China is a currency midget by this metric. The Hungarian forint, Turkish lira, and Mexican peso are more widely used in global payments, relative to their issuing country’s share of global trade. On March 26, China set out to give the RMB a boost by launching its first oil futures contract—denominated in RMB. As the world’s largest oil importer, China hopes that exporters will begin setting prices in RMB to track their new benchmark. Such a shift would, China also hopes, help kick-start wider use of its currency and reduce global reliance on the U.S. dollar, in which the vast majority of oil trading is currently done. What are the prospects? Poor. Oil exporters, especially, rely on U.S. Treasury markets to invest profits safely. This reliance in turn encourages many of them to peg their currencies to the dollar. Accepting non-dollar payment for oil thereby increases their foreign exchange risk. Rather than act a kick-starter, therefore, RMB oil futures look to be a non-starter. Removing capital controls, however, is a step Chinese authorities seem unwilling to take anytime soon. It would mean losing effective control of the exchange rate, which has been a primary tool of Chinese macroeconomic management for the past quarter-century. So for the time being, at least, expect more capital markets window-dressing—like RMB oil futures.